It feels as if it were only yesterday that Nvidia’s Pascal GPUs were the latest and greatest that the leading GPU manufacturer had to offer, and the GTX 1080 was on top of that hierarchy. Today, not only had it already been superseded by the GTX 1080 Ti the year following its release but now the new Turing-based RTX cards are ready to take the crown. 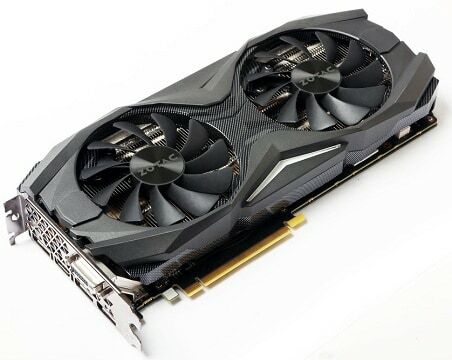 Now, while it may no longer be the very best, the GTX 1080 is still a viable choice in 2019, even with the GTX 1070 Ti and 1080 Ti in the equation. It is more than capable of taking on 1440p, and can even handle 4K in most cases. Without further ado, here are several of the very best GTX 1080 models that you can get in 2019! As usual, we start this list off with a card from Zotac, and if you thought that there was a card which they wouldn’t have a compact variant of, you’d be wrong. 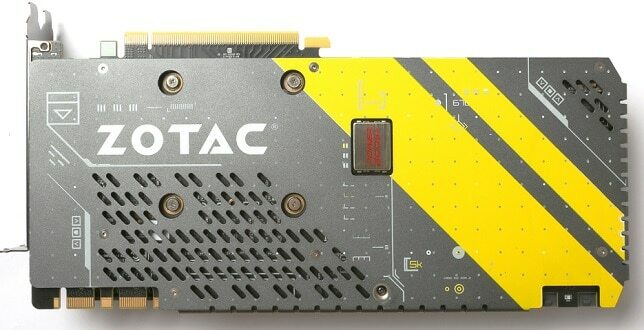 They have successfully packed the mighty GTX 1080 into a modest frame, the result being the Zotac GTX 1080 Mini. Usually, cards designed for Mini ITX cases tend to be a bit cheaper than their full-sized counterparts and they also tend to utilize only one fan. Neither is the case with this one, though – the GTX 1080 Mini is not significantly cheaper than other models, and it utilizes two fans. This is not very surprising, of course, considering that this was 2016’s flagship GPU. At first glance, this Zotac GTX 1080 doesn’t look bad at all, no surprise there. 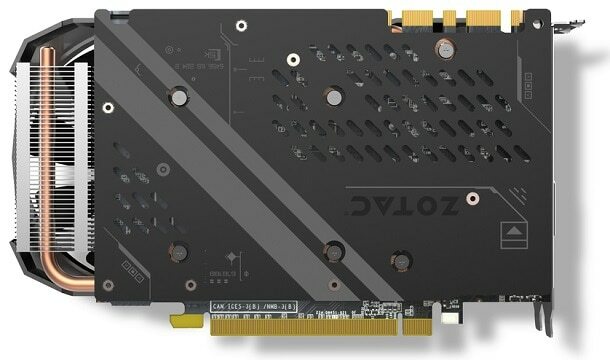 The exterior is quite basic, which is to be expected since manufacturers tend to cut some corners here with the small form factor graphics cards. However, this is still a premium-quality card, and it comes complete with a sleek metal backplate. Performance-wise, the card doesn’t lag too much behind its full-sized counterparts, as the dual Icestorm fans do an admirable job of keeping the card cool. However, since it is only two fans and a modest heatsink we’re talking about, it does get loud under heavy loads and, needless to say, it is not the ideal model for overclocking. At the end of the day, this is the ideal GTX 1080 for those looking to build a Mini ITX gaming PC or use the card in an external GPU enclosure. 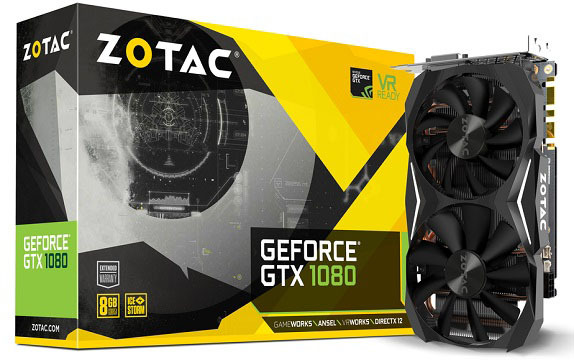 The following model also comes from Zotac, although it is a more serious, full-sized graphics card: the Zotac GTX 1080 AMP! Edition. This model shares many similarities with the above ‘mini’ variant, boasting a similar exterior design, dual-fan cooling, and a premium-quality build. A new addition with this model is Spectra LED lighting on the front, as well as the signature Zotac yellow highlight on the backplate. The AMP! Edition GTX 1080 from Zotac is pretty much everything that you’d expect from a card such as this. It offers great performance, solid overclocking capacity, and the LED lighting provides that extra flair that seems to be unavoidable with high-end gaming products today, although it is not real RGB, coming with only 7 colors to choose from. Our only real qualm with this card is the yellow stripe on the backplate. While we definitely like it, others might not, and yellow is hardly a neutral color. That said, we would have preferred having an RGB stripe on the back instead, and if not that, then simply a regular grey backplate that would blend more easily with other components. 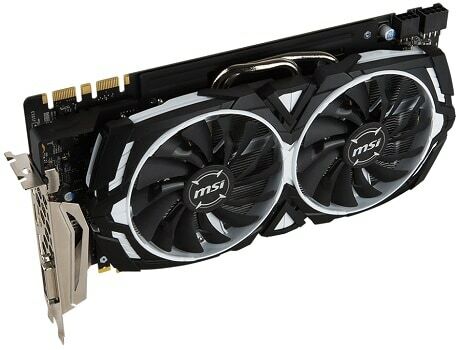 Another manufacturer that is simply unavoidable in any component talk is MSI, and their MSI Gaming-series graphics cards always seem to find their way into our buying guides. However, this time around, we’ve opted to go with a more modest MSI Armor solution instead. 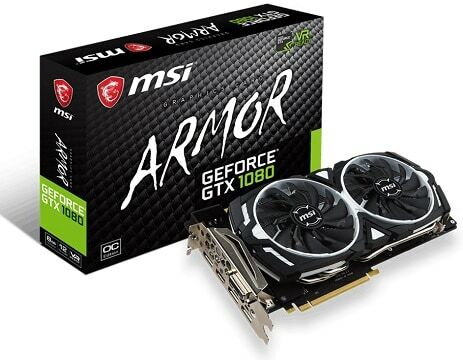 The MSI Armor GTX 1080 lacks the bombast and aggressive gaming-oriented design of the manufacturer’s more popular line of graphics cards, but it is a gaming graphics card nonetheless. It employs a simple black and white exterior, and is cooled by dual Torx fans. Ultimately, the key area where the MSI Armor GTX 1080 excels is the pricing. It is one of the cheapest, if not the cheapest models available at the moment, and that is definitely something worth mentioning. It doesn’t disappoint in the performance department either, as the dual Torx fans do their job well, and it is capable of hitting decent clock speeds when overclocked. But of course, considering the price, there was inevitably some corner-cutting involved. In this case, it was obviously the design. The card’s simple black and white exterior look and feels a tad cheap, definitely not something that you’d expect from a high-end GPU. Of course, there’s no backplate either. In any case, if you’re looking for a bargain on a GTX 1080, we can’t think of a better model than this one. Sadly, there’s no denying that it just isn’t the best-looking GTX 1080 out there, so if you consider that an important factor, too, then best look to another model. 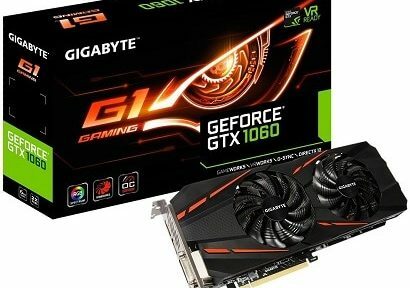 And finally, we have a graphics card from Gigabyte, and it’s a good one: the Gigabyte GTX 1080 G1 Gaming. Like most Gigabyte cards, it is characterized by a black exterior with orange stripes, a sleek metal backplate, and striped Windforce fans. 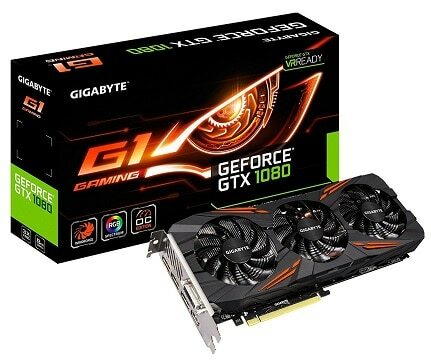 As is to be expected, RGB lighting is also present, although it is limited to the Gigabyte logo and the ‘fan stop’ sign on the side of the card. Needless to say, this is the best-performing GTX 1080 on this list, and one of the best-performing models that are available right now. This is, naturally, in no small part due to triple-fan cooling. 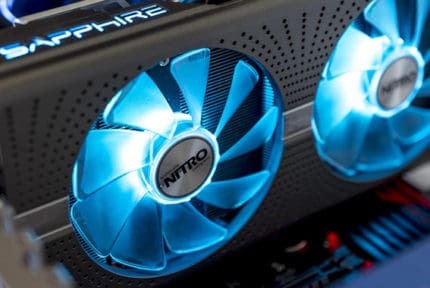 Furthermore, while it is the priciest card on this list, it is actually not that expensive when compared to some other GPUs that rival it in terms of performance. Our chief issue with the Gigabyte GTX 1080 G1 Gaming is its sheer size, the same issue we often see with triple-fan graphics cards. Because of this, you will have a harder time fitting it in smaller cases, though this is unlikely to be a problem for anyone with a regular ATX case. And now, which of the above-described models would we choose as the very best one for 2019? 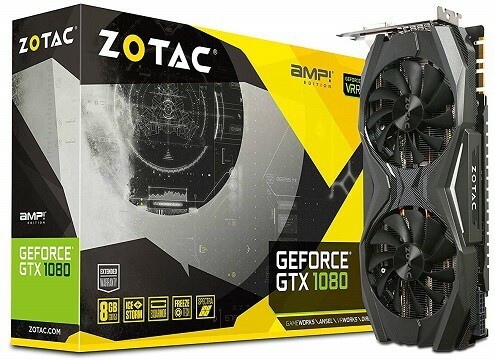 Well, our pick would have to be the ZOTAC GeForce GTX 1080 AMP! Edition. All things considered, it simply offers the best value for your money, bringing great performance at a relatively low price point. Sure, it may not be the cheapest GTX 1080 out there, but when we consider the performance and the build quality, as well as the design and LED lighting, it makes for a very appealing choice. But that is only our pick. If you’re looking for the cheapest variant possible, the MSI Armor version is the obvious go-to solution. The Zotac Mini remains the best choices for small form factor cases and the Gigabyte G1 Gaming model is left as the performance-oriented variant for those who want to overclock their GTX 1080 to the maximum possible effect.